That is the message from the UK's All Party Parliamentary Group on Smoking and Health. The All Party Parliamentary Group say there is "no good evidence" that standardised cigarette packs would lead to more smuggling, an argument held by those opposed to plans to legislate standardised packaging in the UK. Tobacco companies have said plain packs could easily be illicitly copied, but the politicians said security features could still be used on standard packs. One MP said the UK has a good record in recent years in tackling the illicit tobacco trade.The government consulted last year on mandatory standardised packs. The results of that consultation, held from April to August, are still being considered. The All Party Parliamentary Group on Smoking and Health said that existing packaging was already "cheaply and readily" copied. Members said enforcement agencies do not rely on pack design to test whether packs are illegal - instead they use a number of security features, all of which could also be present on standardised packs. Group chairman, Liberal Democrat MP Stephen William, said: "The UK has a good record in recent years in tackling the illicit tobacco trade, although it remains a serious challenge. "Contrary to tobacco industry propaganda there is no good reason to think that standardised packs will increase illicit trade. "The tobacco industry knows that standard packs will cut the number of children pulled into this lethal addiction - that's why they are running an expensive and mendacious campaign to try to scare the government off." 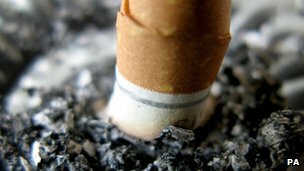 According to charity Cancer Research UK about 207,000 11- to 15-year-olds take up smoking every year in the UK. It said figures from an annual 'Smoking, Drinking and Drug Use Among Young People in England' survey suggested 570 children smoked for the first time every day. The charity urged the government to commit to plain, standardised packaging of tobacco, which is considered less appealing to youngsters. The parliamentary group called on the health secretary to follow Australia's lead and introduce plain packs in the next parliamentary session. Last December Australia became the first country in the world to introduce plain packaging for cigarettes. All tobacco company logos and colours were banned from packets. Instead there is a uniform colour with anti-smoking messages and photographs. The tobacco company name and brand variant are allowed in small print at the bottom of the pack.